Be sure to subscribe to my YouTube channel where you will find all of my videos, including HUNDREDS of inspirational Tools for Transformation. that you can download, print and share with others. Be sure to check out the information on pH and emotions if you have cancer, candida or other major health issues! Heart Connections is a powerful method to increase self-love and remain emotionally balanced. This simple meditation offers a means to connect deeply with the Source of All, your Soul and Spirit Guides. It is also an important tool to heal imbalances with friends, family and foes, as well as imbalances from trauma with past events and locations. by prominent authors on this topic. Click on the titles below for additional resources. ROBERT OGILVIE CROMBIE (Roc) (1895 – 1975) has written several delightful books on his experiences with Nature Spirits. Learn truth from fact as he reveals his conversations with Pan and many other elemental spirits. His books are available on amazon.com and Findhorn Press. entering another calendar’s date to discover the corresponding Gregorian date. IAN LUNGOLD’S site (1949 – 2005 We miss you, Ian!) Explanation of Mayan Long Count calendar, correlating with his mentor, Carl Johan Calleman. Videos, jewelry and an easy and informative codex to decode any Gregorian / Tzolk’in date for purchase. Informative date converter from Gregorian to Tzolkin calendar. Click here to download the notes from this video. Case studies of Michael Newton’s clients while in a hypnotic state. They reveal how past lives affect our current life, what happens after death and interesting insights of what occurs between lives. The “ABRAHAM” group, through ESTHER HICKS offers the original source material for the current Law of Attraction wave that is sweeping the world, and it is the 21st century inspiration for thousands of books, films, essays and lectures that are responsible for the current paradigm shift in consciousness. Listen to dozens of segments on YouTube.com! Simplified creation story answering why there is pain and suffering in our world. First published in “Conversations with God Book 1,” which I highly recommend to all seekers. Click here for an audio reading with illustrations from the book. Available as a beautifully illustrated book. Many Lives, Many Masters This book is a classic in the field of parapsychology. It is the true story of “Catherine,” a patient who unexpectedly begins to narrate her “past lives” during hypnosis and discovers that her past lives contain the clues and cures to her present life problems! DOLORES CANNON (1931 – 2015) had experience as a hypnotherapist for over 45 years before she passed away in 2015. She has written 17 books describing how the universe operates, ET experiences and so many topics that will boggle your mind. Her information comes from her clients as they share their experiences in past lives while under hypnosis, some all the way back to their original spark of Divinity. Get a taste of her work through numerous interviews available on youtube.com. WALT WOODS (1926 – 2011) was past President of the American Society of Dowsers. On his site, he offers five booklets, either as a free download or you can purchase them for a nominal fee. These booklets provide invaluable information for beginners to advanced dowsing. In addition to being a gifted, intuitive tarot reader, BRANDY JOY offers several other modalities to assist on your life path. Interested in becoming a tarot reader or honing your skills? Check out Brandy’s Vibe Tarot Masterclass! Find the root cause of many physical ailments. the root cause for physical ailments. 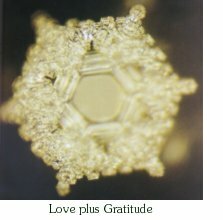 Physical evidence of how our thoughts, words, emotions and intentions affect the molecular structure of water. When you consider that the majority of our planet as well as our bodies are made of water, it becomes clear that our thoughts, words and actions directly affect our body. This pocket reference book by LOUISE HAY has helped thousands of people reverse dis-ease by becoming aware of the impact thoughts have on the body. Ideal for hundreds of ailments, daily use, travelers and children.